Losing post-pregnancy weight is a goal for many new moms, but weight loss after giving birth can be a much different experience than it was before pregnancy. A new schedule and a new baby can also complicate the post-pregnancy weight loss process, but it is possible to get back into pre-baby shape -- and, most importantly, to do it in a healthy way! Here are some easy and effective tips and recipes to help you set and achieve your post-pregnancy weight loss goals. As you know, your body changes a lot when you're pregnant, so it's unreasonable to expect that you'll immediately get your pre-baby body back overnight. Go easy on yourself and your body… and don’t give up! As with any weight loss program, slow and steady weight loss is healthier and more sustainable in the long run. Many moms lose about ten pounds when they give birth and should aim to lose approximately one pound per week once they start a post-pregnancy diet. Instead of making major changes in your daily routine, focus on changing small habits you can control such as stocking your fridge with low carb foods and taking the stairs instead of the elevator whenever possible. Celebrate when you achieve small goals, and don't stress if you don't hit some of them right away. But Don’t Forget to Exercise! Once you are cleared by your doctor, incorporating exercise into your daily routine is crucial to losing baby weight. You don't have to join a gym or go on a three-hour run to see effective results, though. Taking a stroll around the block or going for a light jog are easy ways to stay active that don't require big time commitments. And if you're trying to work your abs, modified crunches and push-ups are the way to go. If you are having difficulty finding time to work out because you don't want to be away from your baby, incorporate your little one into your workout! Hold your baby securely to your chest while you do light squats and lunges; the baby will serve as extra weight for your workout. Just make sure you're in shape enough to ensure both you and your baby's safety. Crash dieting is neither a safe nor healthy way to lose weight for anyone, especially new moms. You want to lose the baby weight slowly and steadily, without putting any undue stress on yourself or your body. 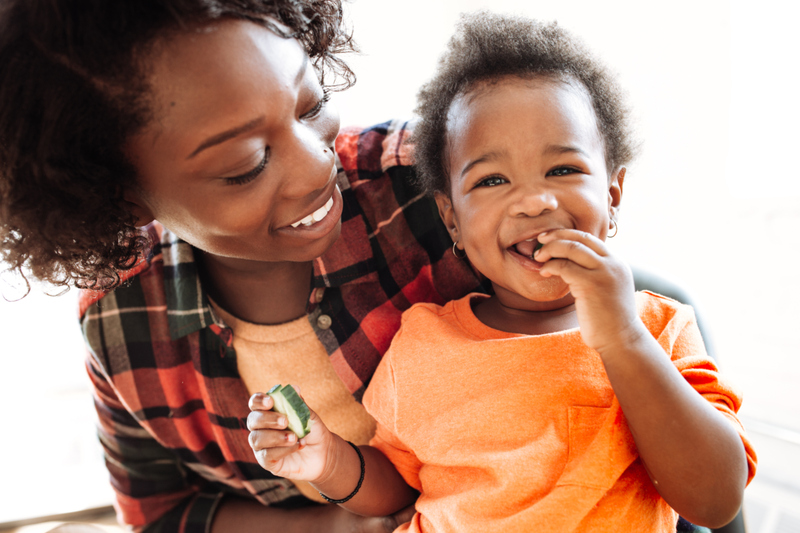 Eating wholesome, balanced meals that are packed with nutrients will boost your energy levels, support consistent weight loss, and, if you’re breastfeeding, helps your baby get off to a great start. It is essential for new moms to be fueled at all times, so spread out your meals over the course of the day and make sure to get an even amount of calories at every meal. Drinking plenty of water—not soda or fruit juices high in sugar—throughout the day will help you stay refreshed and more alert. Keeping hydrated can also help speed up your metabolism, leading to easier weight loss. As with all Atkins phases, build your eating plan around protein, including lean meat, poultry, seafood, and eggs, Greek yogurt and cheese, as well as healthy natural fats such as olives, nuts/seeds and their butters, and avocados. Eat plenty of red, orange and leafy green vegetables and one or two servings of fruit such as strawberries, blueberries, or grapefruit daily. Preparing your own food is probably the last thing on a busy mom’s to-do list, but it is the best way to ensure you are eating the right foods with the correct portions without hidden ingredients. Phase Two of the Atkins Diet is a great place to start post-pregnancy because it is conducive to slow, steady weight loss and supplies adequate calories without sacrificing delicious, filling foods high in important vitamins and nutrients. Work toward losing extra baby weight with these easy, healthy recipe ideas for new moms. Eggs are an excellent source of protein, cook up quickly, and can often be made in one pan and can use almost any ingredient that you have in the fridge. Try an omelette, scramble, or this delicious and simple Chorizo, Green Chili and Tomato Frittata recipe approved for all Atkins phases with 3.1g net carbs and 22.2g protein per serving. Because Salmon contains a fat called DHA that is crucial to the development of babies' nervous systems, this superfood is a great option for new moms trying to lose baby weight as well as those who are breastfeeding. This Cauliflower Salad with Salmon comes together in 25 minutes with minimal work and has 7.2g net carbs and 25.8g protein per serving. Leafy greens are valuable sources of vitamins and minerals that are especially important for breastfeeding moms. To make sure you're getting the nutrients you need, try this Grilled Chicken over Baby Spinach, Tomato, and Avocado Salad for a quick, healthy and protein-packed meal. Prep extra ingredients to save time and enjoy this salad throughout the week. When you're in need of a quick snack or side dish, whip up a sweet Mixed Fruit Salad. Fruit is a healthy way to satisfy your sweet tooth and add healthy vitamins and nutrients to any meal. And you don’t need to stick to the recipe! Use whatever fruits you have on hand and toss everything in one bowl. Orange segments will give you an instant energy boost and blueberries will provide you with a healthy dose of antioxidants. Baked casseroles are great meals for new moms since they can be made ahead of time or frozen and reheated when you need a quick dinner. This easy recipe for Grilled Chicken Cauli Mac and Cheese is hearty, filling, and delightfully cheesy. Vegetarians can enjoy without the grilled chicken, or also try another filling low carb meal like this Eggplant Lasagna recipe. Join the Atkins community for inspiration, motivation, and to share YOUR tips with other new moms like you!